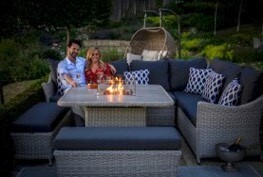 Extend your living space outdoors with one of the latest dining or lounging sets. 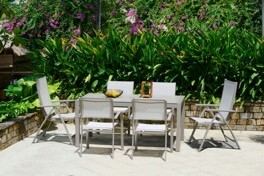 Lightweight, hardwearing and virtually maintenance free, outdoor furniture just gets better every year. For all-round alfresco living, you could enhance your main dining set by adding reclining chairs or even a double hanging cocoon – perfect for patios or small space living. 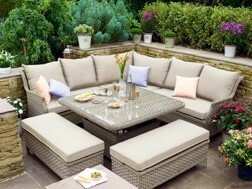 Choose furniture that comes with ‘season-proof’ cushions that can be left outside in our unpredictable summer weather. And make sure that your cushions are ‘LOFAAssured’, which means that they have been tested to the highest standards and comply with fire regulations. All cushions at Squire’s are ‘LOFAAssured’. Keep your party going from day to night with this luxurious Monterey dining set in a blue grey wicker weave, complete with season-proof cushions and a firepit! 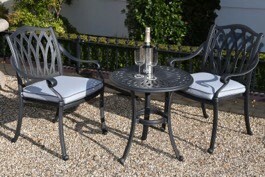 This metal furniture set is made from rust proof cast aluminium and includes the grey bistro table, two armchairs, and season-proof cushions. These chairs have a smooth reclining action that promises instant relaxation. Two chairs, stools and season-proof cushions are included in the set. 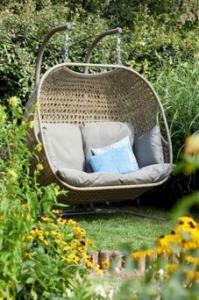 Curl up and let the gentle lulling swing work its magic. 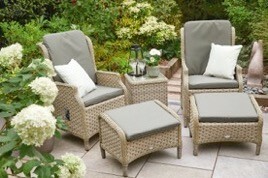 Made from wicker weave, maintenance free and easy to clean. A stylish casual sofa suite made from a wicker weave, which is maintenance free and easy to clean. Includes season-proof cushions. The table adjusts in height, so you can use it as a coffee table or a dining table. 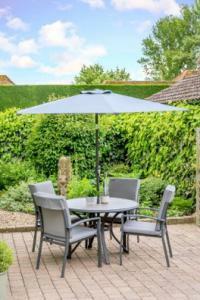 This suite has a sleek modern design and includes the dining table (160cm x 88cm), four stacking chairs, two multi-position chairs, 2.5m crank and tilt aluminium parasol, and parasol base.